In the photo below, I’ve shown most of the buns upside down, but when serving pan fried buns, you should plate them with the crispy bottom down. 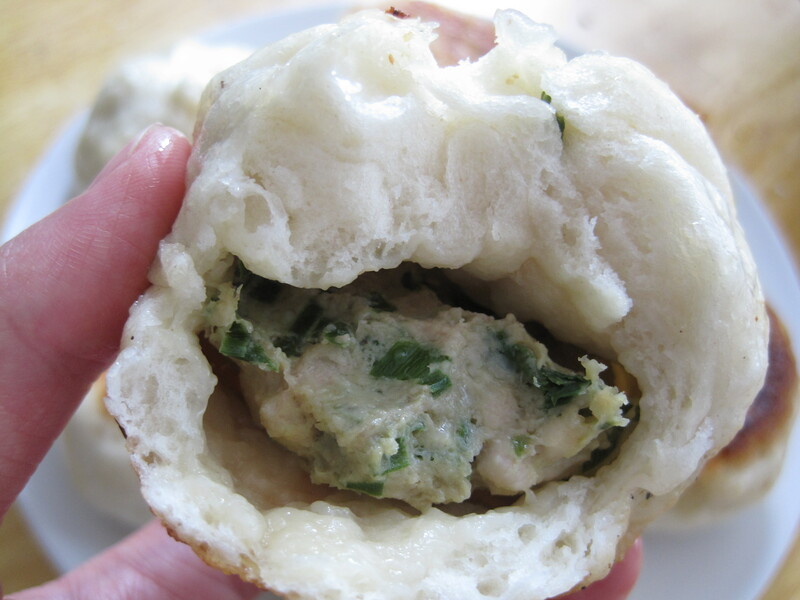 Note: Although any steamed bun dough will work, it is more appropriate for pan fried buns to have a thin and chewy bun, as opposed to a super soft one. So I recently used the chewy dough recipe below to make pan fried buns. Otherwise I prefer the steamed bun dough recipes listed here. Note: This bun recipe is meant to give a chewy texture, but any steamed bun dough will work. See here for softer steamed bun dough recipes. Use your favourite savoury filling. Or, see here for a pork and napa cabbage recipe and see here for a chicken or pork and Chinese chive recipe. In a large bowl, mix together the flour, yeast, 1/2 tbsp oil (if not using lard or shortening) and enough water for the dough to be formed. The guideline provided in the original recipe was 45 g of water for every 100 g of flour, but I just added water a few tablespoons at a time until the consistency was workable. Knead the dough until soft and smooth. If your dough is too wet, add light dustings of flour as necessary. Then knead in the 1/2 tbsp of lard or shortening (if not using oil). The dough should not be sticky. This took me at least 15 minutes. Cover the dough loosely with a damp towel and allow it to rest at room temperature for at least 10 minutes. The longer the dough rests, the fluffier the texture will be, the more dough you will have to work with (as it will rise), the larger the buns, and the thicker the wrapping will be. See here for buns made with dough that only rested 10 minutes (notice how thin the wrapping is). 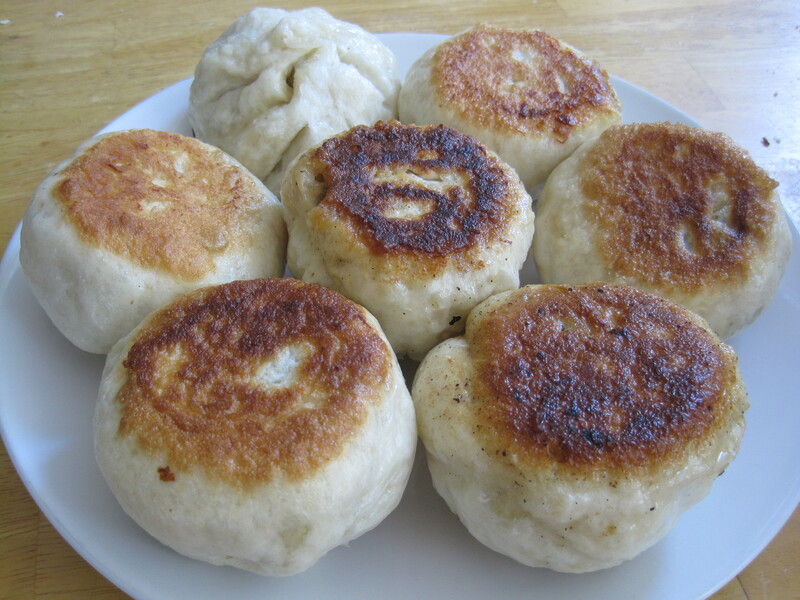 See the photo below for buns made with dough that rested until doubled in size. Do whatever you prefer. Then roll the dough into a long cylinder and cut the dough into 12 equal pieces. Work with one piece at a time, keeping the other pieces covered loosely by the damp towel. Roll a piece of dough into a ball in your hand and flatten it between your hands or use a small/thin rolling pin on a silpat (silicone) mat. Note that using a rolling pin will give you a smoother finish. Either way, you want a thin circle of dough that has a thicker centre than the edges. (If you’re using a rolling pin, I highly recommend watching the second video instruction posted on the original source.) Add 1/12th of the filling into the centre of the dough round. To wrap the buns: See photo instructions below for how to pleat a bun. Using two fingers, pinch one area of the dough together to make a pleat. Fold the immediately adjacent dough to form another pleat next to it and overlap the two pleats. Pinch the ends of both pleats together and gently stretch the dough out a bit as you continue these steps all the way around the bun. 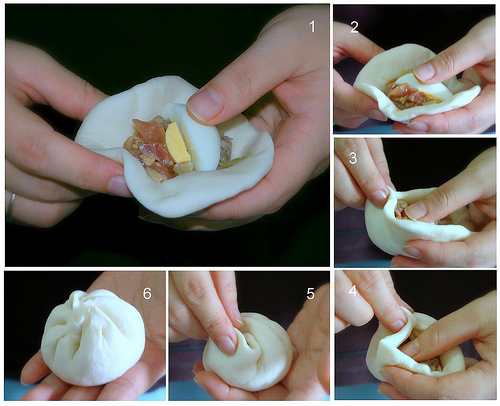 The last step is to seal the bun by pinching the opening closed with a twisting motion. Place the bun on a sheet of parchment paper, pleat side up and repeat with the remaining buns. Over medium high heat, generously coat the bottom of a large non stick pan and heat the oil until it reaches smoking point, but don’t allow it to burn. Then, very carefully to avoid getting splattered by the oil, add your buns, pleat side up, to the pan. You want at least 1 inch of space between the buns, so you may need to cook them in 2 batches depending on their size. Allow the buns to cook until the bottoms are beautifully golden brown, about 1 minute. The buns should not be sticking to the pan, they should slide around easily. For the next step, you must be extremely careful adding the water, because the oil will splatter violently. Covering the pan with a splatter screen will help but it will still be dangerous. Add enough water to just cover the bottoms of the buns, approximately 1/4 inch high. Remove the splatter screen if using, place a lid on the pan and reduce the heat to medium low and maintain a strong simmer. Allow the buns to steam until all of the water has evaporated, the buns are cooked through, and the bottoms are crispy and nicely browned, about 10 to 12 minutes. There will still be some oil remaining in the pan. Transfer to a plate and serve immediately with dipping sauce(s) of your choice. If your buns are sticking to the pan, make sure that you used enough oil, that the oil was hot enough when you added the buns, and that you gave the buns enough time to brown prior to adding the water. Add more oil as needed and raise the temperature of the oil between batches. I borrowed these awesome photo instructions from the My Kitchen food blog.